Dr. Tom Valone writes in the preface to the 2004 edition of his book Electrogravitics Systems that he was contacted by a Maryland resident who was an eyewitness to a late night flight of the B-2 accompanied by two chase planes. He told Valone that he could clearly see the bright violet glow around the fighter which verifies the presence of a high voltage corona in the million volt range. 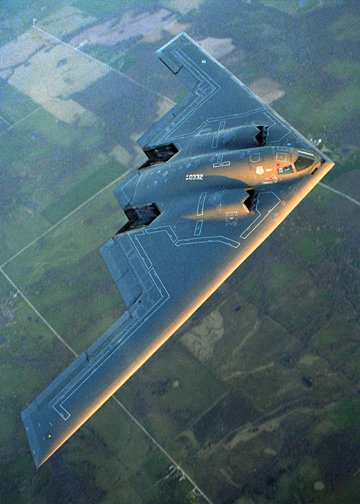 This substantiates the theory presented in my 1993 paper, The U.S. Antigravity Squadron, which proposed that the B-2 charges its wing leading edge to a multimillion volt potential. Even the B-2’s trailing end would be at a high voltage potential relative to the ions emitted in its exhaust stream and hence could explain why it is seen to be enveloped in a violet glow.